Groups are allowed to cancel up to 4 weeks before arrival minus 50.00€ of administrative costs from deposit taken. Group No Show is strictly non-refundable. 30% deposit once the group is confirmed (refundable up to 4 weeks before arrival, minus 50.00€ of administrative costs). Remaining 70% up to four weeks before arrival (non refundable). 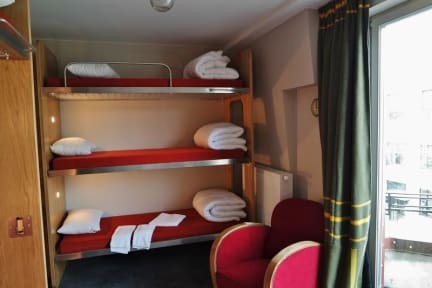 Train Hostel has very easy access to the tram , train and bus lines which can bring you to the city center and all its tourist attractions, European Quarter and NATO Headquarter. If you are train fans don't miss Train World, a unique museum displaying historical trains, including the oldest steam engine in Europe, just 100 meters from the hostel. The Atomium and Brussels Expo are 3 km away. 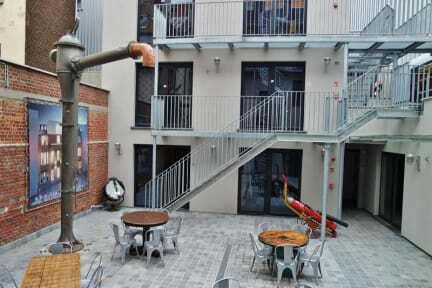 The nearest airport is Brussels Airport, 7 km from Train Hostel. Schaerbeek is a great choice for travelers interested in Architecture, Trains and Beer. Train Hostel has 36 rooms. All rooms have private bathrooms with a shower, while cabins have exterior shared bathrooms and showers. Check in from 15:00 to 23:00. After 23:00 no arrivals permitted to Dormitories unless they pay for an upgrade to a Train Cabin or a Double Room. Late arrivals for all other rooms costs 20.00€ after 23:00. NO EXCEPTION. Payment upon arrival by credit cards, debit cards. (This property may pre-authorise your card before arrival). Uitzonderlijk, vriendelijk personeel. Persoonlijk zou ik tovh koffie en wzter ter bes hikking stellen voor de klanten. I only stayed for one night, but the hostel is very good. The staff is very friendly and the hostel is nicely decorated within the train theme. The room was quite spacious, the only annoying thing was that there were no power points close to the bed. Also, the room was quite hot at night. For the rest I had a lovely stay, I would definitely recommend it! Top! No comments! Slept in the dorm and everything was just easy and perfect. Just next to the train station and the Dockx. I loved this hostel! All of the train decoration gives the place a great vibe. I only stayed for 1 night but I will definitely be back. Staff was kind and helpful, check-in was easy, the dorm was clean and I slept real well in the bed. Some people comment that this hostel's location is far from town; I think it's ok. There's a tram, train and bus next to the hostel, it takes between 15 and 30 minutes to get to the Bourse. Next to the hostel are 2 small grocery shops and some local cafés.